I was interviewed by Jesse Mulligan on his show Technology and Innovation. 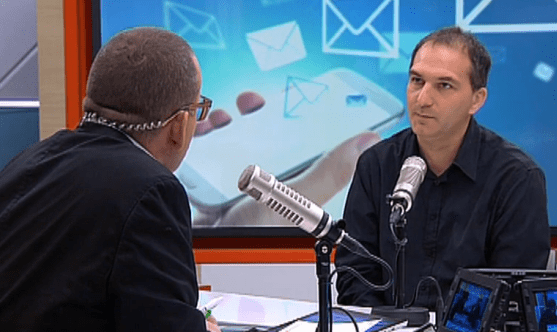 Every week they talk to a kiwi innovator and this week it was me! I was on TV just before the PM, had to stand next to him quietly in the wings while waiting to go on. Paul Henry said he thought the idea was fantastic, said it could be the start of a billion dollar company, and wished me all the best. Was quite a rush! A Kiwi web company has invented an app which reads your emails out loud to you while you’re driving. Beweb designed Speaking Email to help drivers who are tempted to keep across their work emails on the commute to work. Kiwi app lets motorists listen to emails as they drive. 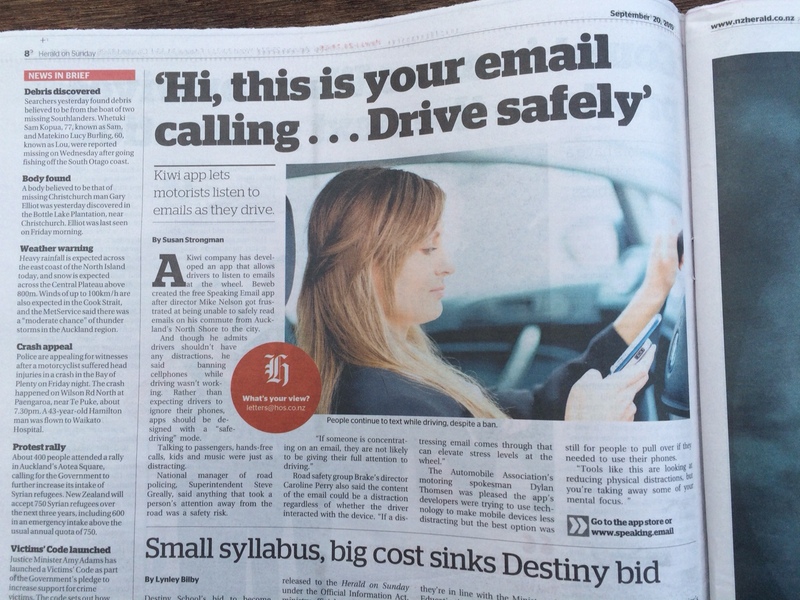 A Kiwi company has developed an app that allows drivers to listen to emails at the wheel. Beweb created the free Speaking Email app after director Mike Nelson got frustrated at being unable to safely read emails on his commute from Auckland’s North Shore to the city. And though he admits drivers shouldn’t have any distractions, he said banning cellphones while driving wasn’t working. Rather than expecting drivers to ignore their phones, apps should be designed with a “safe-driving” mode. NZ’s leading venture, tech and innovation magazine wrote a hilarious article featuring us! Police around the country have been cracking down on driver distraction this week. The Herald reports that Auckland Police have pulled over a man texting on two cell phones while steering with his knees, a man texting with one hand and drinking a beer with the other, and a woman texting while driving three children and towing a horse in a float. But in this always-on/always-connected society, so many of us just feel the need to maximise every second, multi-tasking our multi-tasking. So, if you can’t stand being away from your email while you’re driving to work, there’s a new app that’ll keep your hands on the wheel and your eyes on the road. Speaking Email, is a new app that reads your email to you while you drive. “It’s just like having a radio station with your inbox in it,” says Speaking Email’s CEO and developer, Mike Nelson. A New Zealand company has developed a phone app which it hopes will reduce drivers’ phone distraction by reading out emails – until perhaps it reads you the one from the Nigerian prince which will make you a millionaire. Web development company beweb’s first app is Speaking Email, designed after director Mike Nelson said he couldn’t find one to help him on his daily commute from Auckland’s North Shore. With police cracking down on drivers illegally using their mobile phones, he says more such apps should be designed for driving. An Auckland company has developed a phone app which it hopes will reduce drivers’ phone distraction by reading out emails – until perhaps it reads you the one from the Nigerian prince which will make you a millionaire. With the New Zealand Police this week cracking down on mobile phone driver distraction, a locally created app could help drivers concentrate on the road, while checking their emails safely. Speaking Email reads emails aloud, so that users can keep in touch with work, without being distracted. The app was developed by Auckland web development company, beweb, after director Mike Nelson got frustrated with the lack of such a product on the market. He wanted to use his daily commute from Auckland’s North Shore into the city to listen to emails, without taking his eyes off the road. “I wanted a safe way to check my email. It takes a lot of time out of my day just going through my email inbox and I thought I could use my commute time to do that. “Drivers should not be multitasking while they drive. They should not have any distractions. But the current system of banning the use of phones isn’t working. You just have to drive around Auckland to see how rife texting while driving is. “So I came up with this idea of making it as safe as possible to use your phone while driving,” he says. Mr Nelson says anything can be a distraction while driving – including talking to passengers, hands free phone calls, kids and music. In contrast, listening to emails is mostly passive and requires minimal to zero interaction. Mr Nelson says that since he started using Speaking Email, he personally feels less tempted to sneak a look at texts that come in. “I’ve found having a safe way to use my phone stops me from engaging in more dangerous multitasking. I see other people looking down at their phones as they drive, and they are obviously not using an app that is designed for driving,” he says. With Speaking Email all text is read aloud from each email in your inbox. Email signatures, disclaimers and reply threads are skipped. You can listen completely hands free. If you have your phone in a fixed mounting you can also use it to triage your email – easy tap or swipe functions allow emails to be archived, flagged or swiped to skip reading. There is also a quick reply feature with pre-loaded text for a ‘thanks’ or ‘ok’. “We purposely don’t allow typed replies because that is cumbersome and dangerous when people are on the roads,” he says. Mr Nelson says “low attention interfaces” are the latest trend in technology – where apps require only a quick glance or fast tap to access and review information. “It’s exciting to have created something that is using the latest technology and the latest trends, but is also a useful product – people need email and they want to make good use of time,” he says. Speaking Email has the flexibility for users to set it up the way that suits their email use – from speaking all emails, just those previously not read out, or only new emails. There’s also options for using multiple accounts and different ways for users to triage their emails. The app is available for iPhone and will be released for Android soon. It works with Gmail, Outlook.com, Yahoo Mail, iCloud and most other email servers. Microsoft Exchange support is currently in testing. Speaking Email is currently available free from the App Store, to promote the new product. Mr Nelson says that from October it will be listed at US$9.99. Beweb has been developing websites and web applications for New Zealand companies since 2000. Speaking Email is the company’s first app. “We saw this as an opportunity to not only create an app that we wanted to use, but to learn the process of creating, launching and marketing an app. “Every aspect of this project has been a lot harder and more time consuming that we would have thought it would be. But it has also been fun and a great way to learn. We now have a lot more knowledge and understanding of apps, and we are able to share this knowledge with our own clients. 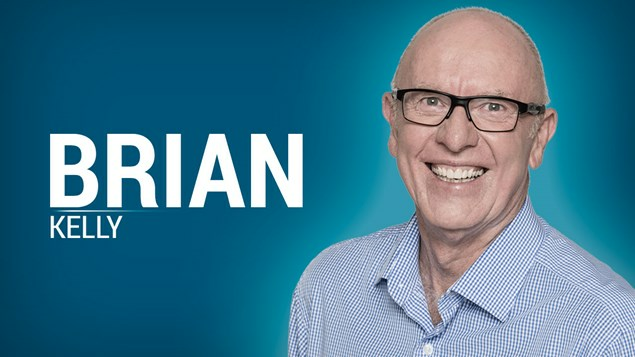 Brian Kelly had a chat to Mike about Speaking Email on his morning radio show Coast Breakfast.